This topic contains 1 reply, has 2 voices, and was last updated by Alexander Bautz 2 months, 2 weeks ago. We have added DFFS Loader by SPJSBlog.com but do not see “enhance with DFFS” at the bottom of the forms. It works perfectly on other lists/libraries but not for Calendar. 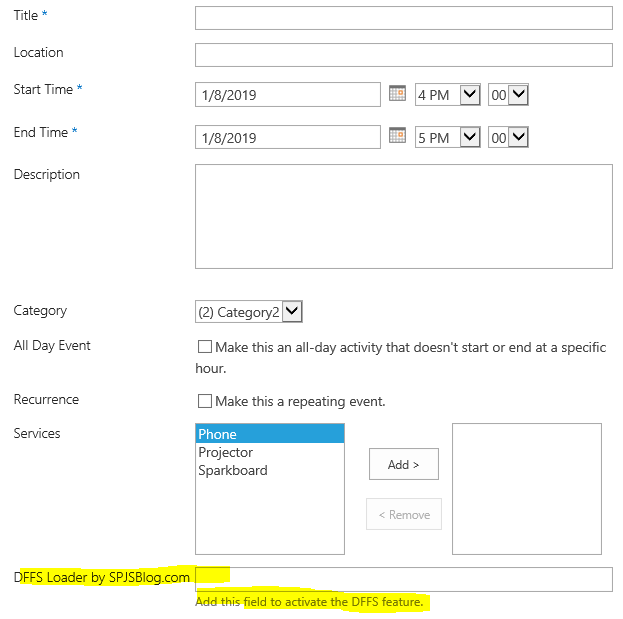 When using the old JSLink installation method in a calendar you must manually add a link to a file “/SPJS/DFFS/JSLink/DFFS_CalendarLoader.html” in the forms (in a Content Editor Web Part). This is because SharePoint does not support JSLink in calendars.